If the Republican Party loses the presidential campaign of 2016, let this serve as the first obituary. The debate orchestrated by Rupert Murdock’s Fox News Thursday shows who is really running the show. 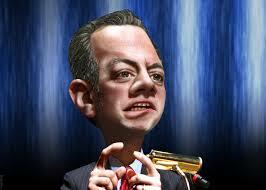 Reince Priebus is the Sheldon Cooper of the Republican National Committee. He is affable, technologically savvy and lacking in the skills of a great leader. The first question to Donald Trump was a question of loyalty, and if Priebus were a strong leader, he would have pulled Trump from the lineup right away. If Phil Jackson called a play for Michael Jordan and Jordan ignored it to pass off to Scottie Pippin, there would be no question of the next move. I admire the strong field of the GOP, but this team needs a great coach. Joan Walsh of Salon magazine has already identified Priebus as the “Big Loser.” His inability to pull a starting player shows him as Sheldon Cooper and not the Phil Johnson needed by strong egotistical players. encourage disillusioned voters to walk from the GOP if Trump self-destructs. Either way is bad for the GOP. The presidential loss of 2012 should have sent Priebus packing, but he was re-elected to lead the RNC in January 2015. His questionable leadership has resulted in subsequent high turnover on the GOP staff. Sally Bradshaw, one of five co-chairs of the GOP Growth and Opportunity Project, has defected to Jeb Bush’s campaign. Priebus is brushing off concerns about the Donald, but the horse is already out of the barn. The other candidates are upset about their placement in the debate and the arbitrary use of national polls. The job that is really on the line today is Reince Priebus’s, and if he cannot get control of this team, then count on the GOP to change coaches in the middle of the season.